Learning how to become a dog trainer isn’t always easy for regular dog owners, and at times it can even become downright frustrating. Of course, you can always find a local dog trainer, but then that can be expensive with fees that can reach up to $40 or even $100 an hour. That’s a rather pricey proposition for most people, but fortunately there’s Doggy Dan and his Online Dog Trainer website. This Doggy Dan Review will give you some basic information on this superb program. It does seem like a rather casual and even silly name, but that’s just the friendly name used by Daniel Abdelnoor. He’s one of the foremost dog trainers in New Zealand, where dogs aren’t just pets but often help with farming activities. Doggy Dan has built quite a reputation in the country, and he has already written several books on dog training and he has been featured in numerous articles and TV shows. This Doggy Dan review is but a small glimpse at who this renowned dog trainer is and can do. 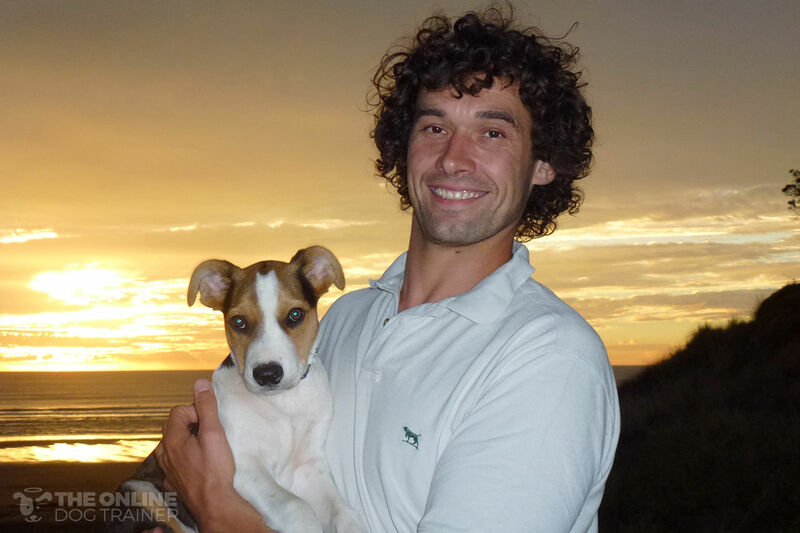 Doggy Dan also a renowned animal rights activist, and his love for animals matches how he trains the dogs in his care. He never uses cruel methods in his training, and in fact his dog training method is the only one that’s officially endorsed by the New Zealand Society for the Prevention of Cruelty to Animals. He doesn’t use “aversion training” or punishment to prevent dogs from misbehaving. Instead, the Doggy Dan training is based on the dog’s natural conformity to the pack hierarchy. Dogs are descended from wolves, and both animals naturally follow the pack hierarchy with the alpha dog as the leader of the pack. The training then emphasizes and teaches the dog that you’re the alpha, which gets you the respect and obedience that the dog is naturally predisposed to give to higher ranking dogs. In fact, the training also emphasizes that your pet is the lowest ranking dog in your pack. This means that they’re taught to regard themselves as lower in the social order than even your children. The pack mentality is normal for dogs, and this is quite evident if you ever see a litter of pups as they grow and get bigger. You’ll notice a difference among them as they interact and play with each other. Some are simply more dominant while others are more submissive. When we did our initial Doggy Dan Review, this one aspect was a little disorienting from our human point of view. But looking at the interaction between wild dogs and wolves, we realized that the concept of pack mentality was very much a reality in the realm of dogs, and in that reality, there was indeed such a thing as a leader of the pack dominating a complex hierarchy of other animals, with each layer directly under the pack leader a little more dominant that the layer below. In the Doggy Dan Training, you will learn about acting like the alpha leader of the pack. The training isn’t just about teaching your pet dog to learn. It’s also about teaching you as well. The truth of the matter is that all dogs can learn proper behavior—if their owner knows what they’re doing. That’s actually a large part of the training program. You have to learn what to do and how to act, and the training program teaches you all these things. While you can read articles and books on dog training, with the Doggy Dan training course the information is presented through videos. You do get some PDF materials, articles, and audio files as well, but mainly the info is shown through videos. Obviously the nature of this particular Doggy Dan Review is limited in terms of the wealth of knowledge and sheer number of videos you’d have direct access to. The Online Dog Trainer program isn’t unique in its use of videos, of course. Other training programs use videos too. However, in these other programs you’ll be lucky if you find a few dozen videos to watch. With the Doggy Dan Online Dog Trainer course, you’ll get at least 250 videos on various topics. What’s more, the site adds new videos every week so as a member you will always find new materials to learn from. Video Topic Coverage is one of the reasons we gave the Doggy Dan Review top marks. The videos cover just about every kind of topic that any dog owner may have despaired about. Don’t even think that your problem with your dog is in anyway unique. Chances are that some other dog owner has had that same problem. What’s good is that all these problems are most likely covered in the various videos. Does your dog bark a lot? Dogs have been known to bark at strangers, other dogs, and maybe even at different objects around the house. In some cases, they may bark at their owners. Some dogs just bark too much, and it can be annoying. If you live in an apartment, the excessive barking of your dog can pose serious problems with your neighbors and landlord. If you have a puppy, their training is covered as well. This includes learning how to potty train a puppy that’s one of the banes of any pup owner. If you don’t know what you’re doing, you can end up with a dog that urinates and poops pretty much anywhere, or even inside the house. However, the videos can show you precisely what you need to do so that your pup can poop only in your designated toilet area for dogs. That saves you a lot of trouble and unpleasantness. Dogs can also be very aggressive, and the videos can help curb that aggression. This can be aggressive behavior against strangers, other dogs, or even your own family members. It’s also common that dogs can be aggressive when they guard their food so that it can be dangerous to approach them when they’re around their food. The videos can show what you need to do to counter these forms of aggression. What about traveling with a dog in a car. Lots of movies and videos show this kind of thing and it seems like fun, isn’t it? What’s not fun is when your dog misbehaves while you’re both in the car driving down the highway or down a steep hill. That’s not fun; that’s downright dangerous when your dog becomes agitated in a car when you’re driving. However, the videos can show you how you can keep your dog calm when they’re inside a car. As you can see, the videos don’t just offer generic advice. You get effective solutions for specific problems, and the videos cover a lot of these problems. The video library doesn’t just contain lectures. It also contains real life consultations. Doggy Dan has personally trained many dogs during his career, and many of these sessions were filmed. This shows you how these methods were designed, and you can see for yourself how they really work well. Another reason why we are so enthused about the Doggy Dan Review. Have you ever tried performing a gym exercise by reading about what you have to do? It’s quite difficult to understand, even if the exercise is as simple as a pushup. It’s the same thing with dog training methods and solutions. While you can get articles and descriptions about what you need to do, nothing is quite as effective as showing you what you have to do. A video demonstration is clearly much easier to understand than any written instruction. You’ll know the correct posture to take when you deal with your dog. You can find out exactly what action you have to do. When you’re issuing vocal commands, you’ll know how loud you should be and what your intonation and pitch ought to be. Videos here aren’t movies with special effects. Here you can see for yourself how a dog behaves before and after the training. You’ll see how they improve over the course of the video so you can confirm for yourself that the methods here work. As part of an honest Doggy Dan Review we would be remiss if we didn’t point out that all the dog training videos are available for streaming only. In other words, they are not downloadable. We acknowledge this a restriction but one that does make sense since if prevents piracy. 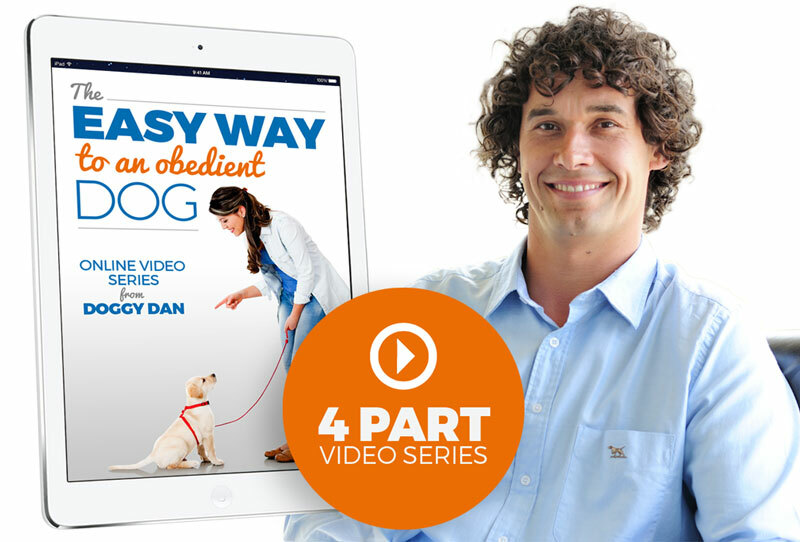 Having said that, as part of this Doggy Dan Review, we have included a special link to a FREE dog obedience video course. All you have to do is to click on the image associated with this text and you will be taken to the Doggy Dan’s website where all of the videos included in this promotion will be made available to you for viewing. This our special thank you for reading our Doggy Dan Review. These dog training videos are but a tiny portion of the huge collection of videos and volume of work the program offers. Not withstanding the fact that once you become a subscriber, you will also have access to a hugely active members only section where Doggy Dan himself interacts with members. One of the things we want to emphasize as you read this Doggy Dan Review is that violence towards the animals being trained is very much a no go item. It’s an unfortunate fact that quite a few dog owners tend to punish their dogs cruelly when they misbehave. They can hit the dog and sometimes they may even hurt dogs. People can yell at their dogs or they may even spank or kick their dogs as part of the training. There’s even a device called a shock collar that shocks the dog with electricity when you press a button. You know the problems with this approach? There are plenty of things wrong with this scenario. One is that it’s just downright cruel. Another problem is that you can end up with a fearful dog. But the real main problem with this approach is that it’s really not effective at all. The use of positive reinforcements—or rewards, in other words—is simply much more effective. That’s the main approach of the Online Dog Trainer. Every time your pooch does something right, you reward them. They can then be encouraged in doing the right thing because they associate the act with good things. The reward doesn’t have to be expensive or even as silly as a clicker. At the start, you may use treats as rewards so that you can help them foster a useful habit such as doing their pooping in the designated toilet area. But you can also reward them with smiles, effusive words of praise, and affectionate rubs. Dogs aren’t really materialistic. They crave attention and praise from the alpha of their pack, and as the owner that’s supposed to be you. If you’re training a puppy, you’re in luck. That’s because the Online Dog Trainer course includes an entire section on raising a pup. This isn’t a section about theoretical problems either. Instead, it’s the real life video diary that covers how Doggy Dan trained a real pup named Moses. It starts when the pup is 8 weeks old, and it ends as the pup turns 1 year old. Here, you don’t just learn about potty training. There’s so much more here, including proper behavior and curbing various misbehavior like digging in the lawn and chewing furniture and shoes. Everything you need to know about raising a puppy is right here. There are 68 videos in this section and it covers every possible topic as it happens to Moses and Doggy Dan. You’ll be able to see for yourself every problem that was encountered, and every solution that worked. In the end, you will then see for yourself how Moses became such a wonderful dog that any owner can be proud of. One of the key concepts that you need to realize is that as the owner you have to fully understand your dog. You have to learn how they view the world and how they view your actions. You need to comprehend how they think so that you can address the various acts of misbehavior. The videos can help with this, and in the end you can get a fuller understanding of your dog. This will then help you tailor your methods so that you can address the cause of the misbehavior that should help ensure that you get a well-behaved dog. To help with your understanding, you can also make use of the community forum. This is a very active section with more than 25,000 members interacting, posing questions, and providing answers. You can discuss various matters with other real dog owners, compare notes, and find out about common experiences with other owners who have the same breed of dog as you do. If you have a Chihuahua, it’s much more helpful to discuss your problems with other Chihuahua owners than with the owner of a German shepherd. You can also have audio downloads, as well as PDFs and other written materials. So you can listen to the information if you’re too busy to watch. Since you can download the audio files, you won’t have to be online to access the info you need. Hyperactive behavior that includes jumping on people or furniture, pulling on the leash, digging and chewing issues, tail chasing, as well various unique obsessions. General disobedience, which can mean not responding to your commands and not even coming to you when you call them. Your dog can be especially aggressive. The dog can be aggressive towards other dogs including the other dogs in your home, towards strangers, and even towards you and your family. You may have a fearful dog, so they may be very afraid of other dogs, other people, or loud sounds. You may also have issues with submissive urination. Other dogs may have separation anxiety or they may seek attention excessively. Barking is also a common issue, and they may bark at doors, while in the car, while on a walk, or when they’re alone on your property. You won’t just learn about specific solutions to these problems. You can also discover the root causes of these problems, so that they can be more permanently addressed. You’ll also understand that there’s no such thing as a breed of dog that can’t learn, or a dog that’s too old to learn. With the Doggy Dan training methods, you find that the age and breed of your dog doesn’t really keep them from learning proper behavior. Normally, the online dog training cost is $37 a month. That may seem a lot, until you realize that it’s just a little more than a dollar each day. It’s also cheap when you consider that some dog trainers (who may have less experience than Doggy Dan) can charge almost $500 for a 3-hour consultation. That makes the $37 a month fee a downright bargain. If you want, you can try out the site for just $1, and you can cancel within 3 days. After the trial period, you’re automatically a member and you’ll be charged $37 each month. There’s still a 60-day money back guarantee, so if you feel that the site doesn’t give you the training you need then you can get the 2-month fee back. You can also cancel the membership at any time. If you’re very sure about your membership, you can cancel the regular fee and you can even skip the trial period entirely. Instead, you can sign up for 6 months right away and you’ll be charged $147 for the entire time period. That’s $24.50 a month, so you save $12.50 each month. What Do People Say about the Doggy Dan Online Dog Trainer? For the most part, they simply rave about the program in their Doggy Dan reviews. It’s worth every penny according to the people who have tried it. Some owners have despaired about the misbehavior of their dogs, and they may have even been on the verge of giving them up. But even nightmare dogs have become downright angelic after the Doggy Dan program. By trying out the Online Dog Trainer, some owners have been regarded as saviors and heroes by their family. Many marvel at how even their most hardheaded dogs have turned obedient. These owners are also astonished at how great it is to feel in control of their dogs (instead of seeming as if the dog was in control of them). A lot more have cited about how the program solves specific problems. Owners talk about hyperactive dogs that don’t jump at owners anymore, aggressive dogs who have become best friends with their owners, dogs who now can be left alone at home while the people can go to work or go out for chores. Others also are surprised at how quickly things can improve with the right techniques. In some cases the improvements were overnight! It doesn’t even matter what breed of dog you may have. You’ll find very grateful owners with different breeds saying the same thankful words of praise for the website. Is It Perfect? Nothing is perfect really. But it’s really effective. Now we’ve gone over the many benefits and advantages of the Online Dog Trainer, but does that mean there’s nothing wrong with it? Unfortunately, there are some aspects of the course which can stand a bit of improvement. The first thing you need to understand is that the videos can’t be downloaded. You have to go online so you can stream and watch the videos. This is purely a business decision that’s quite understandable. It’s so that customers have a reason to maintain a membership and so that the information can be reserved for actual members. Imagine if the videos can be downloaded. If that was possible, then there’s nothing stopping a customer from downloading all the video content so that they can get several months’ worth of information with just a single month’s fee. In fact, they can even download all the videos with the trial membership. That’s not the extent of the problem. If the videos can be downloaded, then they can be shared freely to everyone, and some may even feature the videos on their website and charge people to watch them. That’s not a viable business model, which is why you need to stream the videos instead of downloading them. While it’s an understandable proposition, there’s no denying that it can be inconvenient for you if you don’t have Internet access when you want to watch a video. The other main area for improvement with the Doggy Dan training website is that the videos aren’t recorded in modern HD standards. So in a way it’s like watching an old-style VHS tape or analog TV show. It is true that the videos contain crucial information that you won’t really mind that the videos aren’t in HD. It’s also true that the site has recognized this failing and that the website operators are actually converting some of the videos to HD. But still, not all the videos are in HD yet and that can be annoying. It’s quite obvious that the advantages and benefits of the Online Dog Trainer program outweigh the costs and minor problems with the site. Not being able to download videos and not having them in HD are all simply trivial disadvantages compared to the crucial benefits you can enjoy. With this, you can get the video demonstrations you need so you’ll know precisely what to do. You can find solutions to specific problems. You can also forge relationships with thousands of other pet owners all over the world, and it’s especially helpful when you can bond with owners who have the same breed of dogs as you do. But in the end, the most important thing about the Doggy Dan online Dog Trainer site is that the methods recommended and shown here are not cruel and yet they’re extremely effective. You can end up with well-behaved dogs that won’t pose any sort of problem, and that’s worth more than anything in the world. It leads to a happy life for you, your family, your neighborhood, and for your dog as well.